Cathay Pacific is the flag carrier of Hong Kong and at its home base Hong Kong International Airport (HKIA), it has no less than seven lounges, including four Business Class, two First Class and one Arrival Lounge spread throughout the terminals. Located near Gate 2, The Wing Business Class Lounge spans over two levels. (Not to be confused with The Wing, First which is located upstairs immediately after passport controls) There are lounge seating and a selection of food & beverages on both levels, but the showers, over 20 of them, and IT Zone are located downstairs. The showers are well-equipped with toothbrush set, hair dryer, cotton buds, and feature products from Australian skin care brand Jurlique. Comparing the levels, upstairs, is the more inviting space due to its airiness and views out onto the tarmac. Various lounges and seating are available including Cathay’s exclusive Solus Chair designed in collaboration with Foster + Partners. At the back of the lounge is the Coffee Loft, serving barista-made coffee along with cakes and pastries, but I’d recommend trying the traditional Hong Kong style ‘Milk Tea‘ (港式奶茶). There are plenty of reading material available for you to enjoy in a Cafe style setting. Then on the other side is The Noodle Bar where they serve made-to-order dishes like Wonton noodle soup (雲吞麵), which was actually really delicious and authentically Hong Kong. On the main buffet station, there’s a good spread from local favourites like barbecue pork bun, steam dumplings, fried noodles to a more western palate of salads, sandwiches, wine and cheese. Plenty of tables are available in the main dining area but it would’ve been even better if they had high chairs for the little ones (Unfortunately, no high chairs at The Bridge lounge either). 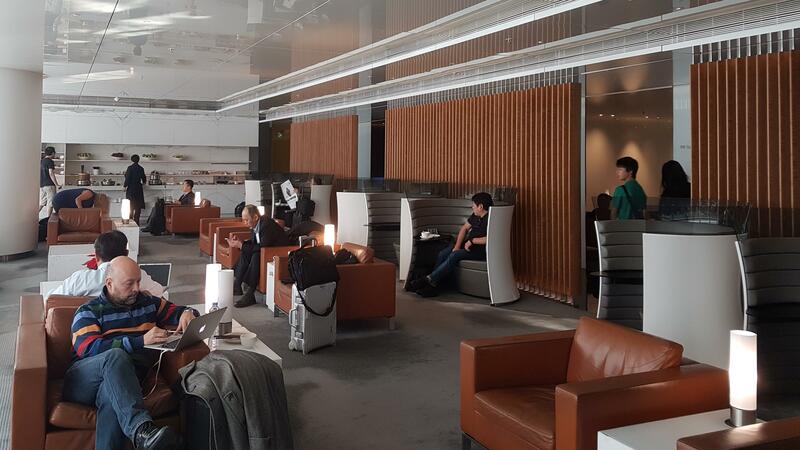 Overall, The Wing Business Lounge is definitely one of the better airline lounges but it can get busy due to its proximity to passport control. Comparatively, The Bridge lounge near Gate 35, offers a much quieter experience.